This year a colony of eared grebes took up residence on the west bay of Big Lake near the southernmost inlet from Atim Creek. Eared grebes feed primarily on aquatic insects and crustaceans and thus prefer shallow lakes as rearing habitat. In Central Alberta nesting usually begins in early to mid June. Incubation lasts 20 to 22 days. Newly hatched youngsters spend some time riding around on their parents back and fledging follows within 20 to 21 days. 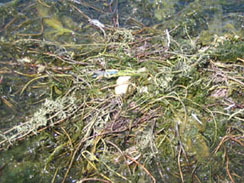 The primitive grebe nests on Big Lake, built with floating vegetation loosely gathered together, held on average two or three eggs this year. Nests seemed precarious, the wake from a motor boat, even one travelling at moderate speed, might easily have rendered them asunder, dumping eggs and hatchlings into the lake. It's no wonder grebes prefer to nest on secluded lakes with little or no water traffic and avoid areas with buildings along the shoreline. 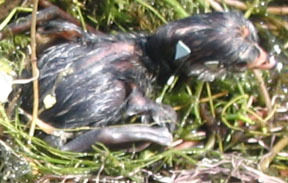 Even the approach of a canoe has an impact on grebes during the critical period after eggs are laid and before fledglings leave the nest for the first time. When disturbed by human activity, parent grebes typically vacate the nest leaving eggs and young birds easy prey to gulls and crows. The Provincial Government (Alberta Sustainable Resource Development) is conducting an ongoing study of eared and western grebes of Central Alberta as part of its Species at Risk Program. The program has identified another human impact on grebe habitat, that being snowmobiles. Studies found that nesting was delayed on some lakes and nests were sometimes poorly constructed because of insufficient emergent vegetation, some of which had been destroyed by snowmobile traffic during preceeding winters. Western and Eared Grebe Field Summary Reports for 2002 (Alberta Species at Risk Report No. 60), 2004 (Alberta Species at Risk Report No. 94) and 2006 status report (Alberta Wildlife Status Report No. 60) provide more details on the findings.